Yesterday I finally finished reading Out of Babylon by Walter Brueggemann, one of my favorite Bible scholars (and a fellow UCC guy). It's perhaps the most level-headed book on the topic of empire that I've ever encountered. As good as they are (and trust me, they're good! you should read them), many of those books give little credibility to the justification claims of the United States and in their haste to highlight the imperial and oppressive action of the U.S., they do sometimes marginalize the virtue of the nation. While Brueggemann admits that it's easier for him to see the United States as an empire, counter to the "local tradition" of the Church (and I'm definitely with him here), he also acknowledges America's paradoxical ability to carry a local tradition of it's own. He acknowledges that not all will be convinced that America is an empire and so his parallels and conclusions are drawn all the more carefully and all the more fundamentally embedded in reference to the Biblical narrative. For folks whose nationalistic pride and patriotic ideology are so unwavering that they cannot accept America as an imperial force to be resisted by Christians, this book will still have some value (that's remarkable). But still, the major motivating thrust behind this book is that Christians might identify, one way or another, their alternative "over-againstness" in relation to nationalistic identity and embrace the local tradition of the Gospel that the empire seeks to silence and to forget. In other words, he wants Christians to be able to offer a firm "no" to invitations to engage in imperial complicity and an unadulterated "yes" to Jesus and his alternative good news. From the earliest pages until the end, the feeling that kept coming back to me was disappointment. Definitely not disappointment in the book itself (it was awesome!). Disappointment, rather, in the fact that this book (and books like it) needed to be written in the first place. It's sad that any convincing needs to be done when it seems so utterly obvious, at least from a Biblical standpoint, that the Kingdom of God is not of this world, not of the systems and nations of this world. The gospel is and always should be an alternative consciousness, calling us to an identity only possible, indeed only even thinkable, through discipleship. If we had listened to the local tradition of black Christians throughout American history, we wouldn't need a lesson on how America has been an imperial force. They had no trouble at all applying the "Babylon" reference to the American empire. If we had been more attentive to our Native American neighbors who were essentially conquered and brutally imperialized by the American empire, there'd have been no need for Brueggemann to write this book. But that is precisely why we need books like this. We've so forgotten our local tradition, we've been so complicit in the imperial craftiness of erasing and enveloping all the prophetic and local traditions that even our own Christian identity has been wrapped up in American patriotic heritage. 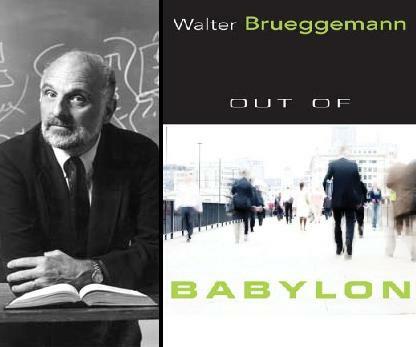 We've been lulled to sleep by the benefits of American imperialism and Walter Brueggemann wants to wake us up. That makes Out of Babylon nothing less that a prophetic call to repentance and an invitation to enter the dominion of God. I highly recommend this book. Read it, consume it, be changed by it.